MBMI’s The Roots class, the Gaines/Oldham Black Culture Center and the Department of Social Justice come together for a new memorial scholarship. The 2018 scholarship recipients, members of The Roots, and Kedar’s family gather for a photo. Through the support of the Mizzou Black Men’s Initiative The Roots class, the Gaines/Oldham Black Culture Center and the Department of Social Justice, there is now an official account for the Kedar I. Boyce Memorial Scholarship! 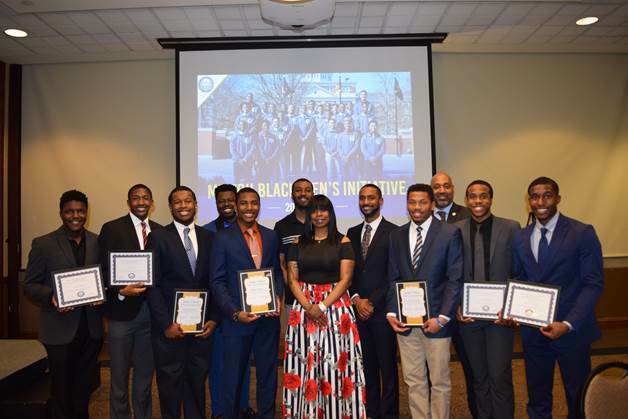 This scholarship is named in honor of the late Kedar Ishmael Boyce, a participating member of the original class of Mizzou Black Men’s Initiative (MBMI), also known as The Roots, in 2009. On Feb. 24, 2017, Kedar lost his life in a motorcycle accident. To honor his legacy, The Roots developed this memorial scholarship to aid young MBMI brothers as they transition into their sophomore year who exemplify academic achievement, passion for education, good character, and brotherhood. The Roots were able to raise and award $600 in scholarships in spring 2018. As MBMI celebrates 10 years on Mizzou’s campus, they will be awarding the Kedar I. Boyce Memorial Scholarship again at the MBMI End of the Year Banquet Celebration in April 2019. If you are interested in donating to this scholarship fund, checks or money orders may be made out to the University of Missouri with “MBMI Scholarship” included in the memo line. You may also donate via the Scholarship MoCode F1769. Any support would be deeply appreciated. Congratulations to the newly revealed members of Mizzou’s secret societies! Researchers investigate discrimination experiences of MU students, parent-child communications in low income families. The culinary expert of Fab Five shared his experiences on the Netflix hit and his cooking skills with MU students. Join Chancellor Cartwright for this week’s Inside Mizzou podcast where he talks with three undergraduates in our McNair Scholars Program. Lexi Wilkinson is a senior studying psychology and English, Cole Diggins is a junior studying soil resource management and Cosette Tomita is a senior studying chemistry.